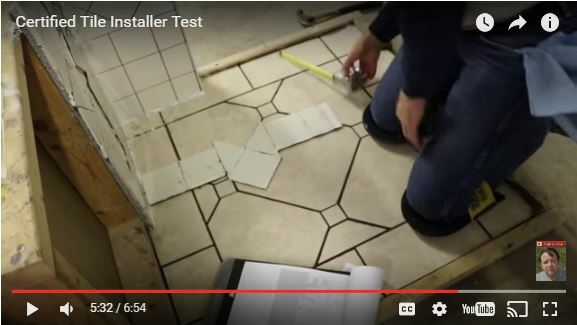 Have you seen this video by Sal DiBlasi about the hands-on Certified Tile Installer (CTI) test? If you haven't and you're considering becoming certified, we encourage you to do so. We've even embedded it into this article. Tile contractor Salvatore DiBlasi is the owner of Elite-Tile Company on Boston’s North Shore. 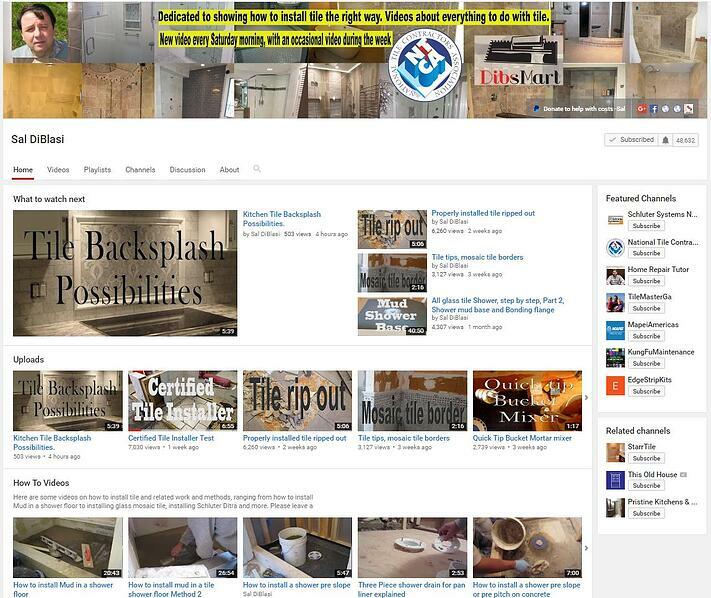 He also publishes videos about tile installation every Saturday on his Sal DiBlasi YouTube Channel. Sal's video channel is all about tile and how to install it correctly. He has over 30 years of experience installing tile and has created many how-to videos where he shares tips, techniques, and advice by showing you actual tile installations of all kinds. He has definitely developed an engaged following with - as of April 2017 - almost 50,000 subscribers and over 24 million views of his many videos, not to mention active conversations taking place in the comments section of the videos. In his video about the CTEF sponsored Certified Tile Installer test, Sal provides an overview of the program with particular emphasis on the hands-on portion of the certification exam. He had the opportunity to visit CTEF in Pendleton, SC where he observed it firsthand. 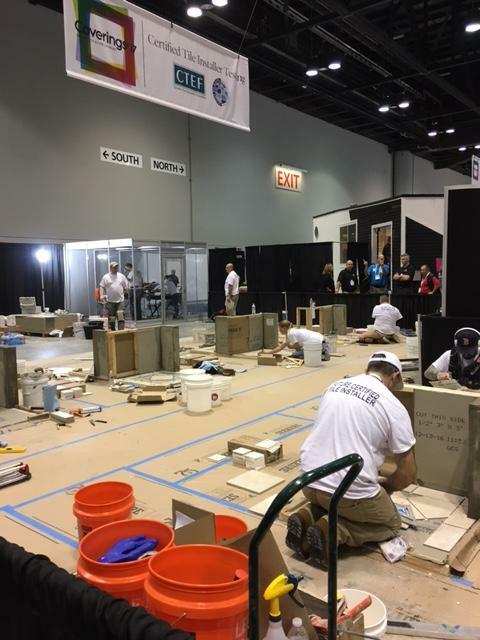 Sal explains how CTEF (Ceramic Tile Education Foundation) launched the Certified Tile Installer (CTI) program in 2008 to provide a means for good, knowledgeable tile installers to verify their skills and promote themselves to potential clients and employers. The program provides consumers with a mechanism for identifying the level of proficiency of prospective tile installers and encourages them to use only the best-qualified installers, ensuring that their tile project is installed correctly the first time, and looks beautiful for years to come. 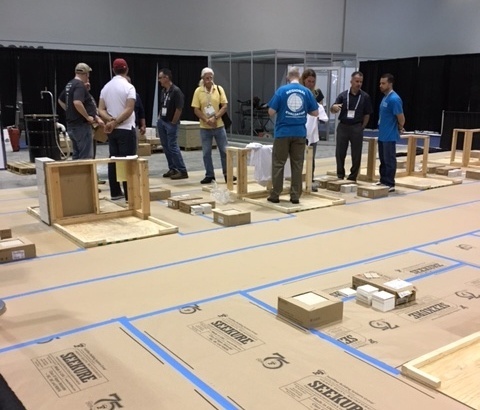 The Certified Tile Installer (CTI) program is a comprehensive testing of the skills and knowledge of experienced tile installers and includes a multiple-choice exam and a hands-on test. Both are based on current industry standards and best practices for producing a sound installation that exhibits good workmanship. Ultimately, the tests require that both the observable and non-observable characteristics of a finished installation be executed properly. The written test, which must be completed before taking the hands-on test, is twenty five percent of the grade while the hands-on portion of the test counts as seventy-five percent of the grade. The hands-on test specifically allows CTEF evaluators to verify that an applicant has the skills to deliver an installation that meets industry performance and workmanship standards. For each installed product, the applicant is scored on the various aspects of workmanship relevant to producing an installation that will endure long term use and satisfy the discriminating client. The hands-on test consists of a mock-up of a tile installation. Now in this video, CTEF's Scott Carothers administered the hands-on test. 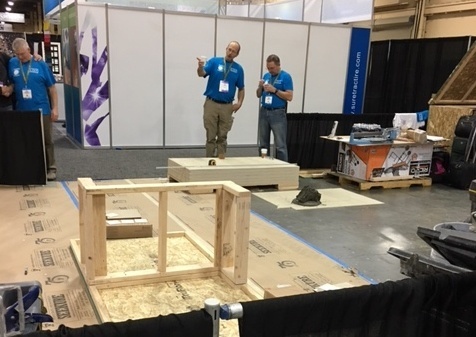 During the orientation, Scott explained to the individual tile installers, that even though the mock-up was small - it’s approximately 25 square feet - it could be the toughest 25 square feet that they had ever installed. "Let me tell you from what I saw, that was actually very true. It was not an easy test." The mock-up consists of a bare wooden frame where the future CTI must install a backer board on the walls and floor as well as tile of different sizes installed in a pattern with a border according to the test parameters. Seams need to be correctly taped, too. You can see the basic mockup in the image below taken during Coverings17. So you may be wondering why take this test if it's not so easy? The reason for taking the test is to verify that you have the skills to properly install tile. You can then reassure people looking to hire an installer that you are a Certified Tile Installer. They can count on getting someone who knows what he or she is doing. Unfortunately, too many tile installations are being installed improperly resulting in a lot of failures, and a black eye for competent installers as well as the entire tile industry. If you hire someone who does a poor job installing tile and you have problems with it, the likelihood that you’re going to do another tile project diminishes. Ultimately, a homeowner wants to hire someone who is competent. Being a Certified Tile Installer is an effective way to demonstrate competence. As you can see in the video, Scott evaluates each installation and each module to see if it was done properly and he grades it. You will see him measuring, taking photos, removing tiles to inspect mortar coverage and inspecting how well the installation meets tile industry installation standards. "Tile installation is not easy and there is a misconception that anyone can install tile. There are requirements for coverage, for expansion and contraction, for all kinds of elements in the installation process. Tile varies greatly in size and quality and type so there’s actually quite a bit to know to install a tile job correctly and there are many different systems that are used as well. So the purpose of this video is actually to bring some awareness to the fact that there are certified tile installers that have been tested and they’re capable of installing a tile correctly and that it’s very advantageous to actually hire one of these installers." Thank you, Sal DiBlasi for creating and sharing this video about the Certified Tile Installer program hands-on test.